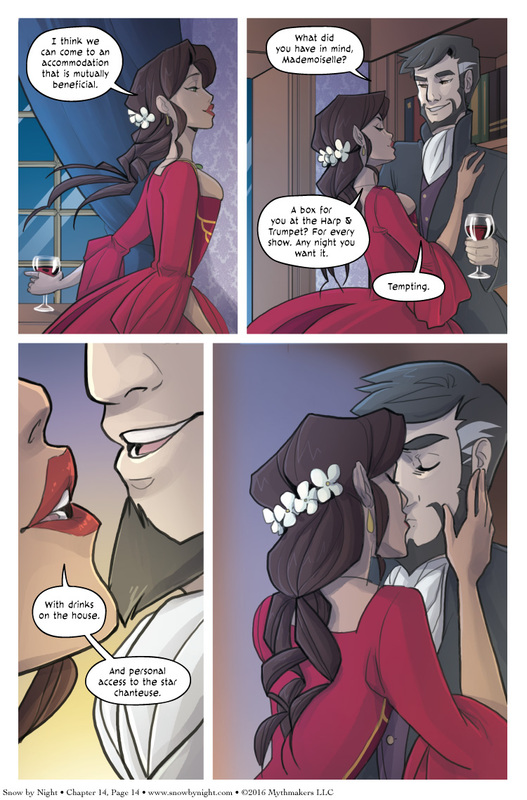 Mathilde puts the moves on Cienan to secure her secrets with one very tempting offer. For all their talk of cleverness on the last page, is this what they were both expecting? Mathilde sneaks a peek on the next page to see how her plan is working, and you can too when you vote for Snow by Night on Top Web Comics. Somehow, I doubt he went to that trouble just to get a mistress. I hope we’ll learn what he’s actually after on the next page! I also doubt that someone in the business of sticking his nose where it doesn’t belong doesn’t have plans for when people are on to him. Oh, I highly doubt that he went to all this trouble for a mistress. Much more likely that he’s interested in the Harp & Trumpet as a place to gather information, for example. Putting pressure on Mathilde ensures that whatever he’s after, be it information or underworld connections, he gets. But he’s a man and hardly likely to refuse when a beautiful woman throws herself at him (unless he prefers men, that sort of thing in this world hasn’t been dealt with in the story as far as I can recall, but in the real-world equivalent time period a man of his rank would make sure to be seen with women and might even keep a mistress despite his personal preferences for the sake of appearances). And, of course, with his rank and wealth Cienan could be very useful to Mathilde if she’s ambitious, as long as what he wants from her isn’t too onerous. Yes, this could be a very advantageous deal for the both of them. Love Cienan´s expression in the second panel: “Please girl, I have been playing the game since you were in diapers”. Erm… well I guess she gets some minor credit for effort but I highly doubt somebody like Ciernan is going to fall for THAT. As president of the “I hate Jassart” Anti-fan club, I’ll agree that Ciernan is smoother and far more civilized, but better? Ciernan is the Devil incarnate, and FAR more dangerous. Hope Cienan has an antidote for whatever compound poison Mathilde has put in the wine and her lipstick. *Slowly leads her over to his trapdoor pit. Because It’s There. He’s using her to get information on jassert. Might even try and even use her to harm him herself on cienan’s behalf. I’m not gonna complain if they get together in the process. Its not a bad match. I am shocked, shocked I say, that she is using her feminine charms to Have Her Way with poor Ciernan.